separate power cord (included in the box). The manual mentions both, see attached pic. LC-E8E just got done using it for the first time. The LC-8E is the same style that came with my 30D and I love the simplicity and compactness. But it's not near as versatile when used with a power strip or when travelling. I have a question. I want to buy the T2i from the States, but I live in Europe. How can I make the charger work? Are there any adapters out there or do I have to find an European charger and buy it separately? 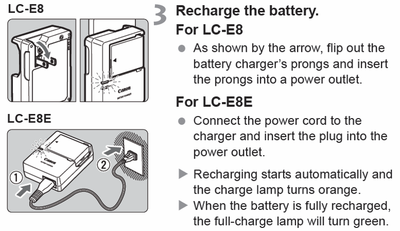 LC-E8E is what seems to be shipping everywhere. it's AC100-240 Volt 50 and 60 Hz. So it will work anywhere. 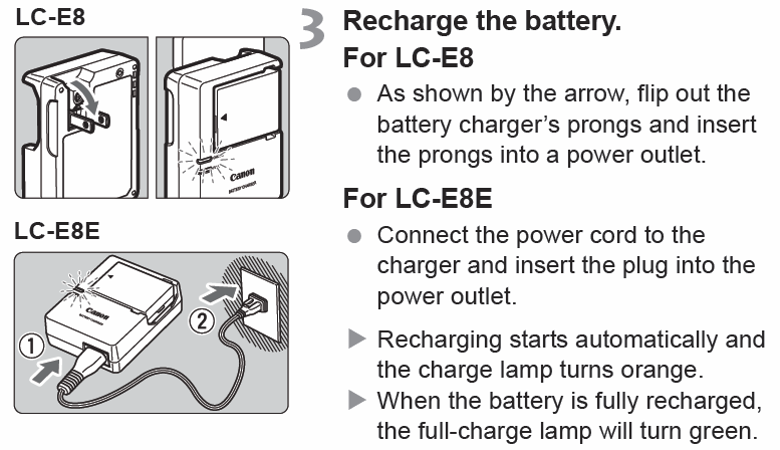 All you need is a new figure 8 power cord and that is an easy to find piece of consumer electronic kit. Almost every consumer electronic device I own has the figure 8 power cord. Oh, that sounds great. Thanks for the info, Konrad.